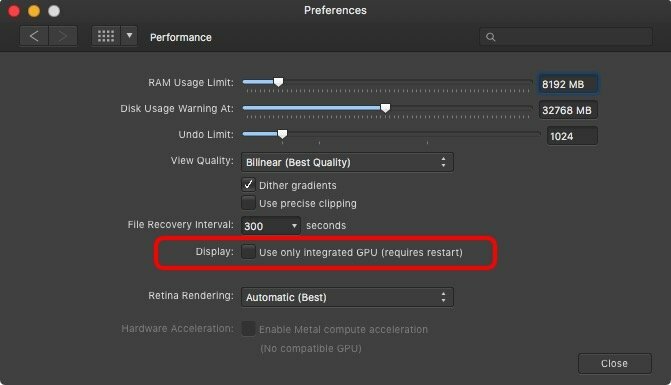 I am also not sure why the "Use only integrated GPU" checkbox (which should be one line lower in the window & not over where the Display popup menu should be) is even selectable in the 1.6 retail or 1.7 beta Affinity apps for iMacs like mine that do not have an integrated GPU. Same here for my iMac. - Possibly the hardware detection/acceleration code doesn't distinguish that well between different iMac models etc., or it doesn't check and work right here at all. ... or it doesn't check and work right here at all. I suspect it doesn't query the hardware directly (which would be the most reliable way to do this) or check a model database or anything like that at all. I think it just allows the checkbox to be ticked whether on not it would have any effect on anything, & relies on whatever signal that sends to the OS to let the OS decide if anything should be changed. Since it doesn't seem to cause any functional problems in Macs that don't have an integrated GPU, I consider it just a very minor annoyance that it isn't greyed out when it isn't applicable. I have the same impression for that setting and it's functional behavior! 1.7.0.106 beta is ok for me, my RX 580 is recognised by Affinity Photo on my MacPro 5.1 and Mojave. It significantly faster, especially on Raw with superimposed gradient ! !